Gecko Ranch ships live geckos and dry goods all over the USA. Gecko Ranch is happy to export (ship outside the USA) dry goods. Canadian live animal export available at this time. Gecko Ranch accepts credit cards,PayPal, cashier's checks, money Orders, personal checks (3 day hold). North Carolina residents add local tax. A 100% deposit is required on all unborn geckos or geckos to be held for any period of time. Please be assured that we will not use the personal information that we obtain from you for any purpose other than the processing of this transaction. Credit card security is one of our top priorities at Gecko Ranch. For this reason we guarantee 100% secure ordering for all of our customers. 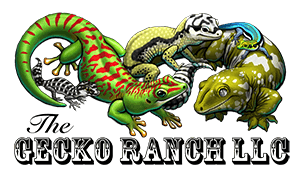 After placing your gecko order Gecko Ranch will contact you to arrange a shipping date. If weather and your schedule permits, we will agree to a shipping date. If there is a weather delay I will update you weekly by e-mail to advise you of when gecko shipping is possible. Gecko Ranch uses FedEx overnight unless an alternative shipping method is requested. Geckos are shipped Monday-Wednesday weekly for next day arrival. On the day of shipment you will receive a FedEx tracking number by e-mail. GECKOS ARE NOT SHIPPED WITHOUT RECEIVING CONFIRMATION FROM YOU FIRST. If you do not receive a confirmation e-mail from Gecko Ranch after placing an order often there is a problem with your e-mail such as spam filters preventing you from receiving e-mail from us. Please call Gecko Ranch at 530-304-7529 if you do not receive a confirmation e-mail regarding your order. LIVE ARRIVAL IS CONDITIONALLY GUARANTEED! If there was no-one available to receive the gecko(s) my guarantee is void. Any problems must be reported immediately! Gecko Ranch will pay for the first $100 of shipping insurance, this usually covers on time arrival only. The total covered should cover both gecko and shipping for on time and live arrival!. Insurance is available $2.50 for each additional $100. Insured shipping needs to occur in certain temperatures and conditions that are only slightly more restrictive than my normal standards here, starting at 38F instead of my 30F for most geckos. Check with me for additional specifics. To collect insurance: Late arrivals must be reported in seven days, DOAs must be frozen and reported within three hours. All captive bred geckos are guaranteed healthy upon arrival. In case of DOA (dead on arrival) the purchaser will receive credit for the amount of a deceased gecko only for on time arrival. In case of late arrival: DOA(s) and shipping are only credited when arrival is late and insurance* has been purchased covering the amount of the shipping and the gecko(s). Customers not paying insurance covering both shipping and gecko(s) are responsible for all shipping charges for replacement of the gecko(s). THERE ARE NO GUARANTEES OR REFUNDS FOR TAIL LOSS as this is an unfortunate circumstance that can occur, rarely, sometimes during shipping or adapting to a new home. Proper sexing is guaranteed only when specified. I have confidence in my packing and shipping of geckos. I've been shipping geckos all over the continental United States since 1993 with a good track record. There may be weather delays in the coldest and hottest parts of the year. I do ship all year to the continental USA and Alaska- there are breaks in the hottest and coldest periods. I monitor the weather at the major shipping hubs and your hometown to determine when the best time to ship is. Federal law states that if you do not receive an internet order within 30 days of placing the order, or by an agreed upon date less than 30 days, you have a right to a full refund. If Gecko Ranch is able to ship your order within the latter agreed upon time periods and you choose to cancel your order before the end of 30 days Gecko Ranch will charge you a 20% restocking fee and will then refund the balance of your payment. There is no cancellation for weather delays as I have no control over this. Packing geckos requires skill, weather analysis, and knowledge of individual gecko requirements. Leopard Geckos are very hardy and can be shipped in a variety of circumstances. With heat packs leopard geckos can be shipped in temps as low as 30F. With cool packs leopard geckos can be shipped in temps as high as 90F. Gecko Ranch only uses 40 or 60 hour heat packs by the UniHeat. These are the superior choice to 30-40 hour heat packs with a longer lasting heat in case of delays. Geckos are kept toasty with 60 hour heat packs putting out well over 100F. These heat packs still put out considerable heat after three days. Current option for live gecko shipping is FedEx overnight with UPS overnight available as a customer requested option. FedEx overnight is $49.50 for most shipments (1-2 adult leopard geckos) larger boxes and rural areas ask for your rate. This includes a $5.00 box free of charge with each order, and a heat,cool pack or cryopack if needed. North Carolina residents may ask for a discount on FedEx overnight shipping, amount of discount will depend on individual shipment, please ask!!! Shipped US Postal or UPS. Dry goods export only with the exception of shipping non-CITES geckos to Hamm, Germany. Shipped Priority US mail, starts at $7.99. Heavier shipments are shipped via UPS or FedEx Ground. You may always ask for expedited shipping!